31 Rockington Way, Crowborough, East Sussex TN6 2NJ. During a delay in the England and Sri Lanka Test at Lord’s this year, I visited the Lord’s library and happened upon this history of the wandering club, The Cricket Society, and for a number of reasons my eyes lit up. I had read Peter Hartland’s excellent book, The Balance of Power in Test Cricket, and had myself been an irregular player over a number of years for The Cricket Society. There are histories of wandering cricket clubs such as I Zingari and the Incogniti which can be found but I was delighted to come across this history not only for personal and happy memories. Anyone can join The Cricket Society for a modest annual fee and the Society boasts, I believe, around 2000 members but the playing membership is more limited. That said, the playing XI came into being in 1949 and plays at attractive grounds - which are selected wisely - from the village green to the Great Lawn at Blenheim Palace ( where foreign visitors watched in amazement at these funny men running around in whites.) There is a fine nucleus of players many of whom have played over 300 games each and the games are played hard, fairly and with great enjoyment. There is much to recommend about the Society’s cricket matches. In this excellent history, Peter Hartland relates the history of all the matches played since 1949, its players and characters, the occasional scorecard and some of the amusing incidents and some excellent photographs. Those many long-standing players are all given a very fine appreciation and the good and not so good moments are mentioned in this delightful and well presented, easy to read book. Test cricketers and First-Class cricketers have made appearances for The Cricket Society and these players are detailed in the statistical section. Peter Hartland, being the Society’s historian, has done an admirable job in compiling this book and the statistical section is quite excellent. It is a testimony to all concerned on the playing side that the records and scorecards all still exist to help this publication be what it is. Records and statistics are also included relating to the various chapters which chronologically detail the Society's matches through the years. Readers will, I am sure, be impressed with the number of matches played by some members, the longevity of their Cricket Society careers, the wickets taken and the runs scored. Regular tours have taken place in Corfu and the Isle of Wight and it is a tribute to the many thoroughly decent cricketers who turn out that The Cricket Society enjoys such regular success with its most successful season being last year. This book is about the playing side of The Cricket Society. The Society itself is a well-respected society whose presidents include John Barclay and Christopher Martin-Jenkins. Regular meetings with well-known guest speakers are held all over the country as well as, I believe, a fiendishly difficult annual quiz and, for all information and details of activities, please consult the excellent website. 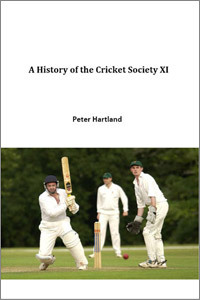 We know of the vast depth and breadth of cricketing subjects which have been written about and once again this book should give pleasure to not only those who have played for The Cricket Society and other members who may read the match reports in the regular members’ bulletin but also those interested in the history of wandering clubs. Anyone who may be interested in joining as a player may be impressed by the content and this is an excellent book.